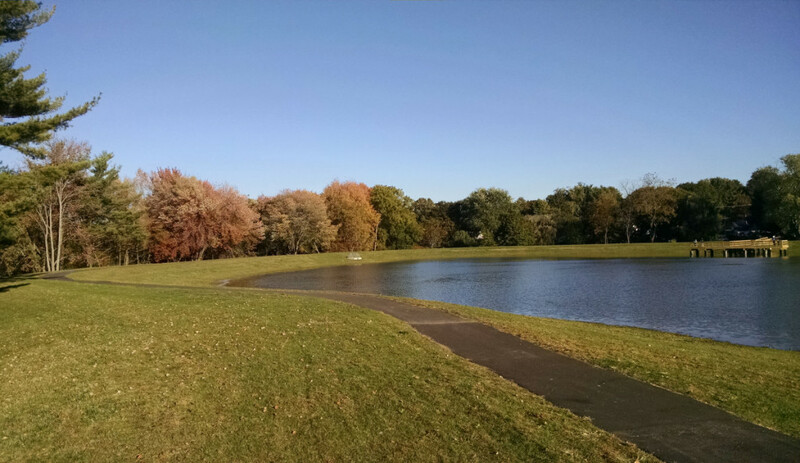 The existing recreational wet pond was expanded to handle stormwater management from the surrounding drainage area. The facility lies in a valley with streams on three of its four sides and receives approximately 250 acres of urban drainage. The goal for this project was to capture this water and divert it into the retrofitted regional stormwater management facility. The stormwater is captured in manholes at or near the ends of the existing culverts that go under Maryland Route 140 and the exit ramp from Maryland Route 140 to Maryland Route 97. PVC pipes are proposed in these manholes to allow the base flow from the culvert to continue into the receiving waters (streams) in which the existing culverts outfall, which minimizes the impacts to the existing streams. The design diverts the remaining water into the retrofitted regional stormwater management facility. This facility provides water quality, channel protection, and flood management for the 250-acre contributing drainage area. The existing facility was re-graded, which increased the volume, and the top of the embankment was raised from about 3′. 3:1 slopes were used on the downstream embankment and 6:1 slopes or greater were used on the pond face in the design of this facility. A safety bench was added around the border of the pond, as required by MD-378 regulations. A forty-foot emergency spillway and a concrete riser were added that discharge directly into the 100-year FEMA floodplain. In order to accommodate the required stormwater management volume, the existing facility nearly doubled in size. This facility is also in a park and, due to this, additional parking was added, as well as a bridge across the pond, a fishing pier (in place of the island being removed), and an ADA accessible walking path around the facility. This site offered many challenges to the design team. There were wetlands, streams, forests and an existing pond on-site that were all being disturbed to some extent. CLSI and the Carroll County Government met with MDE and the Army Corp of Engineers on-site and agreed on a pond layout that would offer the least amount of disturbance to the existing sensitive environmental areas. A Non-tidal Wetlands and Waterways permit was applied for and received. Dam Safety review was required for the approval of this facility. This facility also captured Maryland State Highway (SHA) impervious surfaces. 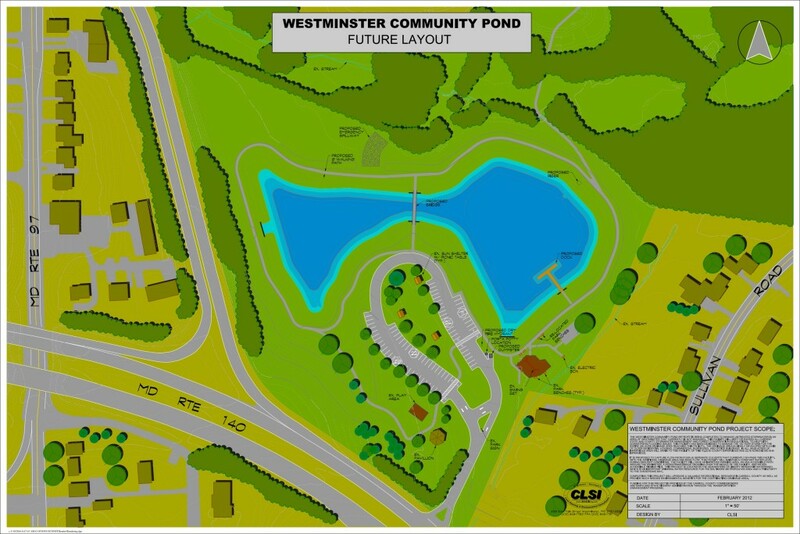 After almost two years and more than $2 million, the Westminster Community Pond has reopened to the public, providing a reinvigorated outdoor recreation venue. During a ceremony Tuesday, the Carroll County Commissioners and county staff were present at the renovated park near the intersection of Md. 140 and Md. 97 for a ribbon cutting. “This wasn’t a revitalization of the park but a reinvention of the park,” said Jeff Degitz, director of the county’s Department of Recreation and Parks. Work at the park included installing new playground equipment, adding additional parking spaces, constructing a trail around the pond, building a foot bridge, installing a pier and enlarging the pond, Degitz said. The pond will once again be a prime spot for fishing, he said. It will be stocked with a variety of fish later this fall and be repopulated regularly beginning next spring. The park is open sunrise to sunset daily. Commissioner Doug Howard, R-District 5, said the planning and energy it took to complete the project are a testament to the dedication county staff had to the park. “This is a byproduct of folks working together to give us another great amenity,” Howard said. Commissioner Dennis Frazier, R-District 3, said that since the community pond is in his district, he has received countless calls from constituents wondering when the project would be completed. “My only answer was ‘soon,’ ” Frazier said. Now that the park has reopened, the next step will be to enhance visitor access to Carroll’s other recreational facilities by connecting the park’s newly constructed walking path to others in the county, he said. Degitz said in a separate interview his department has talked about this possibility for years, and is hoping to connect the walking path at Bennett Cerf Dog Park off Md. 27. The trail would cross Sullivan Road then extend to the business park off Md. 97, he said. He said he is hoping his staff could work in conjunction with the Bureau of Resource Management as was done for the community pond project, Degitz said. “The potential is there to combine the stormwater benefits and incorporate the walking trail into the same project, but there is no hard and fast timeline,” he said. The community pond park was officially closed in January 2014 and the work was expected to be complete by last fall, but changes to the project and the incorporation of stormwater management equipment and practices delayed its reopening, Degitz said. When first planned, the project did not include the enlargement of the pond, he said. With the park being closed, however, it seemed like an ideal time for an expansion, a move expected to enhance the quality and potential of the pond, he said. This meant the county had to obtain waterway-related permits and the weather played a bigger factor than would have been the case without expanding the pond, Degitz said. “Once these [permits] were obtained, the project progressed rather smoothly,” he said. The initial plans also did not include stormwater mitigation, but after being approached by the Bureau of Resource Management, all involved realized “there was a great opportunity to have a better end result,” Degitz said. Janet O’Meara, watershed management specialist for the county’s Bureau of Resource Management, said since the park was closed, it was the perfect opportunity to incorporate stormwater management best practices. These practices will treat an additional 250 acres, which includes 60 acres of previously untreated impervious surface. Bureau staff approached Recreation and Parks several years ago with the idea to incorporate these techniques, O’Meara said. The commissioners had approved $1.9 million for the project in December 2013, but oversight in the areas of clay fill storage, the placement of topsoil and the placement of the pond’s clay liner meant the commissioners had to fund an additional $306,000 last September. The county was able to acquire 50 percent of the total cost of the project from the State Highway Administration’s Transportation Alternatives Program, which offers funding for transportation-related community projects. The program is federally funded, but administered by the state. 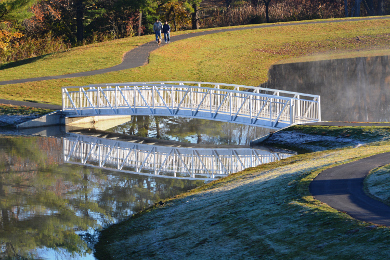 Additional funding for the construction of a pier and foot bridge was provided by the Department of Natural Resources’ Program Open Space, a grant program that aides in the building of outdoor recreational facilities and open space.